The original 1954 Godzilla was imbued with the destructive power and invulnerability of the Atomic bomb. Just three days after Halloween is the birthday of one of the most famous of all movie monsters. She—and in many of her films she is identified as female—may be far younger than standbys like Frankenstein’s Monster, Dracula, or Wolfman, but she dwarfs even the mighty King Kong. I would say she is one of a kind but she has spawned a swarm of imitators. 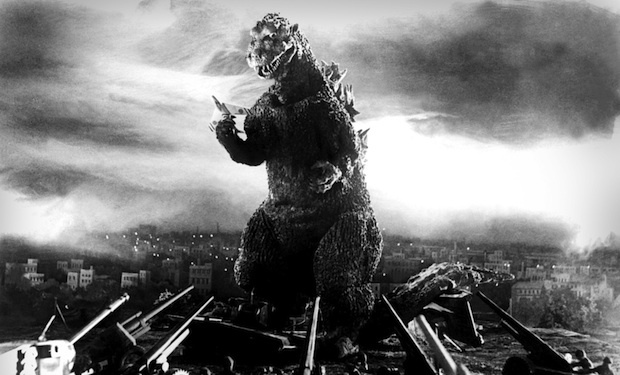 On November 3, 1954 Gozilla strode out of the sea for the first time and scared Japanese movie goers senseless. The science fiction film was produced by Toho studios and directed by Ishirō Honda featuring special effects by Eiji Tsuburaya. The lumbering dinosaur-like monster sank boats, terrorized peasants and made a mess out of Tokyo. 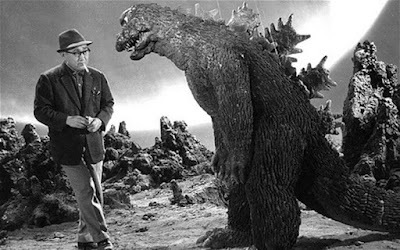 Godzilla was an actor in a ruber suit seen here taking direction on the set from Ishiro Honda. The special effects were impressive, but not up the standards mastered in the American films years earlier by stop action animation wizard Willis O’Brien. Only one brief scene used that expensive technology. In the bulk of the movie Godzilla was portrayed by a man in a rubber suite rampaging through a miniature landscape and city. But technical proficiency was not the reason for the films enormous popularity in its home country and its soon world-wide influence. Producer Tomoyuki Tanaka said, “The theme of the film, from the beginning, was the terror of the [Atom] bomb. Mankind had created the bomb, and now nature was going to take revenge on mankind.” Ten years after the devastation of Hiroshima and Nagasaki the Japanese were processing the experience through a cheap monster movie. In the end, the monster was destroyed by an even greater weapon than the Bomb—the scientist/creator makes sure to burn his notes and commits suicide by cutting the air hose to his diving suit after the super weapon vaporized the monster so that it could never be used again. A pipe smoking Raymond Burr as a reporter was edited into the American release of the Japanese film which was re-titled Gozilla King of the Monsters. The film was only shown in Japanese language cinemas in America, but attracted the attention of poverty row Jewel Pictures, which bought US rights. 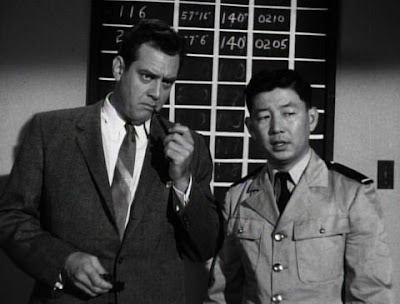 They edited in scenes and narration by Raymond Burr as an American reporter covering the story and released the film as Godzilla King of the Monsters in 1956. This is the only version most Americans have ever seen. The original film finally did get a limited release with English subtitles in 2004. The American version was also released back in Japan and became a hit on its own—part of the Japanese fascination with all things American despite—or perhaps because—of the war and the bomb. Godzilla influenced films across the world. Soon dinosaurs-like creatures were menacing London, Rome, and American cities. They were joined by a wide variety of other giant critters including ants in Them!, an octopus in It Came From Beneath the Sea, the self-titled Tarantula, and grasshoppers in Beginning of the End. And that is just the short list of mid-‘50’s American monster movies. Humans became giant monsters themselves when exposed to radiation in other films, including The Cyclops, The Amazing Colossal Man, and Attack of the 50 Foot Woman. Meanwhile back in Japan Toho studios did brisk business in other monster movies and Godzilla sequels. After the first film they were shot in color and the special effect technology was ramped up to include more sophisticated stop action animation. There were 27 sequels. 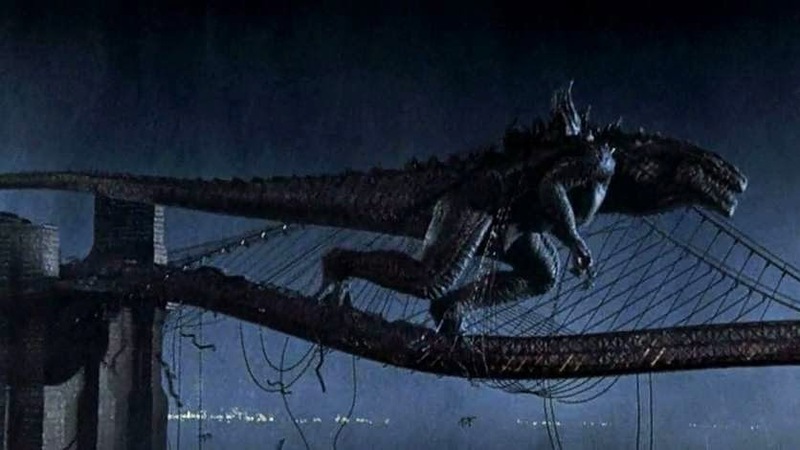 And over time, as post-war Japan prospered and grew confident as a world economic power, Gozilla morphed into a kind of hero, protecting the islands from the menace of other giant monsters ranging from the Smog Monster to King Kong. Hero or not, Tokyo kept taking a beating in the ensuing battles. Although Godzilla originally opened to at best mixed reviews in its home country, it has come to be regarded as a classic. Two contemporary national surveys rate it as the 20th and 27th best Japanese film of all time respectively. British film magazine Empire rated Godzilla as the 31st of the Best Films of World Cinema in 2010. *The slimmed down version of the monster was seldom seen in full, a trick to supposedly build suspense that offended many ardent fans of the original not mention rediculous casting of Mathew Brode,rick as the hero. In 1998 American writer/director Roland Emmerich reconceived Godzilla for a new generation used to modern computer generated special effects. The monster was slimed down and stripped of its back plates and let loose on New York City and a hopelessly miscast Mathew Broderick. The flick predictably made a ton of money but was justifiably hated by the critics and reviled by true fans of the original. In 2014 Legendary Pictures and Warner Bros. rebooted Godzilla yet again with Gareth Edwards at the helm and a promise to return to the monster’s Toho studios roots. Sure enough the look was closer to the original than the sleek version of the 1998 version which looked like a Spielberg Velociraptor on super steroids. With top of the line computer generated animation and special effects, and released in I-Max the film was a top grossing hit that summer. 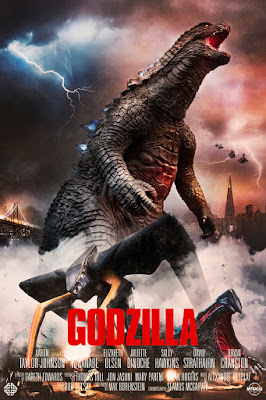 A highly touted sequel, Godzilla King of the Monsters has been frequently delayed and is now slated for release sometime in 2019 and will be followed the next year with a flick paring the monster with another of Warner Bros. updated giant monsters in Godzilla vs. Kong. 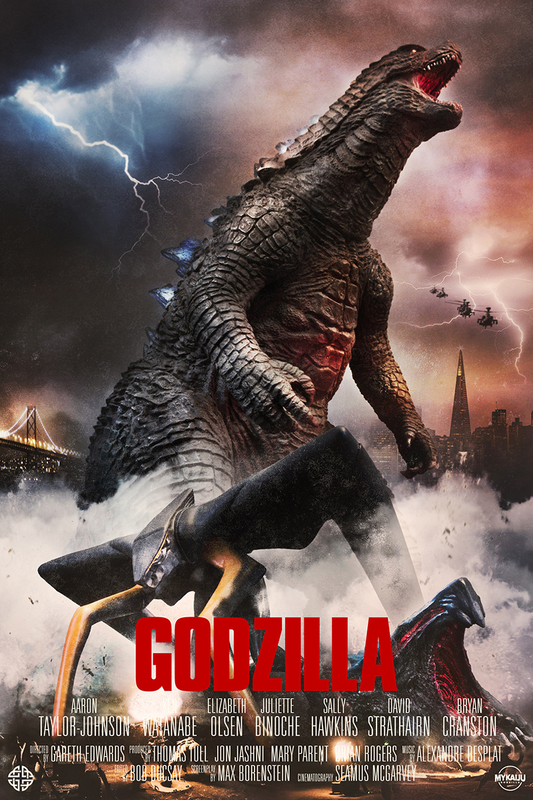 In 2014 Gozilla was an ally of humanity battling other monsters and trashing several cities around the world in the process. Meanwhile the Japanese went back to the well in in 2016 with Shin Godzilla recasting the original story to contemporary times. Instead of nuclear angst, however, the slick production was said by critics to be a metaphor to a national debate on re-armament and what could happen to the nation if it was attacked without a sufficient military force. This version, seen as competition to Warner Bros. new franchise, was frozen out of most U.S theaters and had an extremely limited run in the US but is sought after by loyal fans of the monster on DVDs, Blue ray, and as a download.